Who’s More Worthy of Respect? Without one principle uniting us all, we are all at the whims and mercy of some person or group that is the dominant deciding force … and that uses their philosophy, whether it is religious, political, economic, racial, etc. to divide and conquer for his/her or their own benefit. With a globally accepted principle, we will be able to surpass all “qualifiers” that serve the few versus the many. 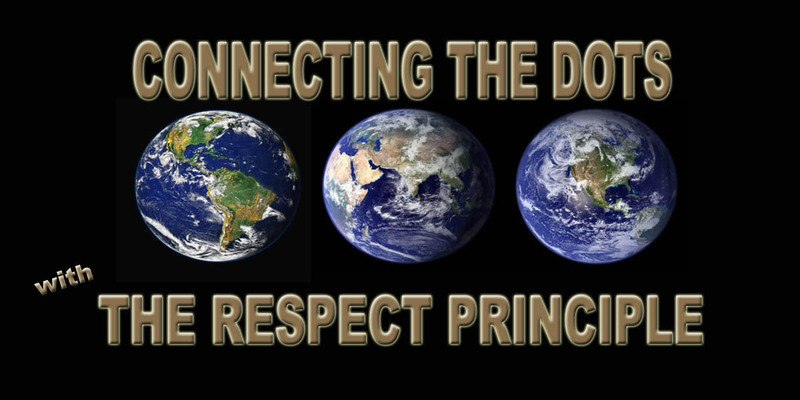 By Connecting the Dots … with the globally accepted The RESPECT PRINCIPLE, we choose a “win win” for all … because the only “qualifier” is being a life. The details on how to transform our world based on our newly accepted principle then becomes the challenge, but people are innovative and creative … and once driven by valuing … respecting … all life, people will be inspired and motivated to design and develop new ways of creating and living in our world. … then all the energy previously spent on deciding “Who’s more worthy of respect” will instead be channelled into all things positive versus negative … and we will rewrite history rather than repeating it.